Tonight was primer night! We’d finished the prep and masking last night, all that was needed before starting was to clean up our workspace and do a last surface prep. 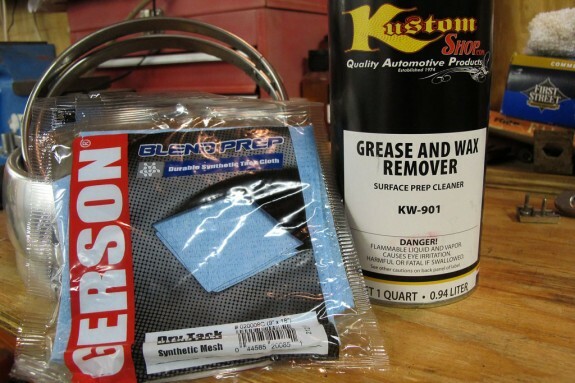 I used a tack cloth and Kustom Shop’s wax and grease remover to cover the surface to be painted and ensure it was completely clean. It’s always amazing how much dirt those tack cloths pick up! 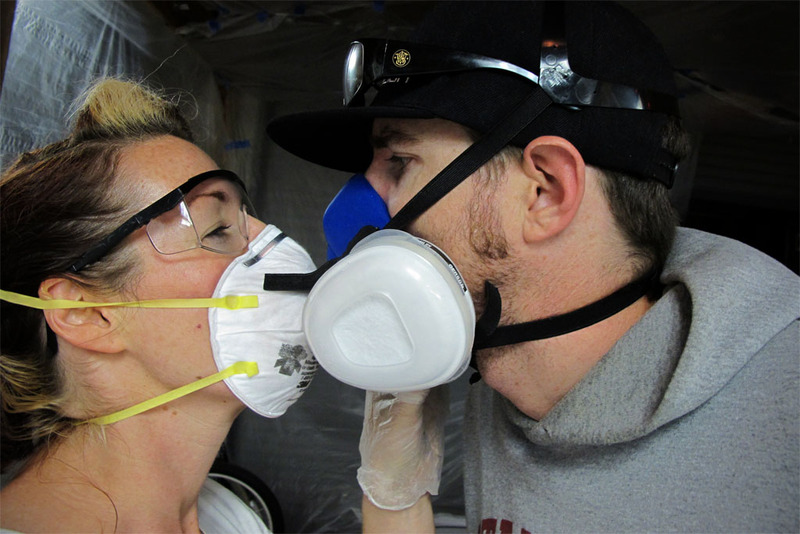 I’m signed up to spray the color paint, so Ethan called dibs on spraying the primer – designating me as the paint mixer. I didn’t get started with that job too well. I shook the paint can as I’d do with any other paint then opened it up and poured it up to the mix line after giving it a quick stir. Then I added the reducer and took it to Ethan. 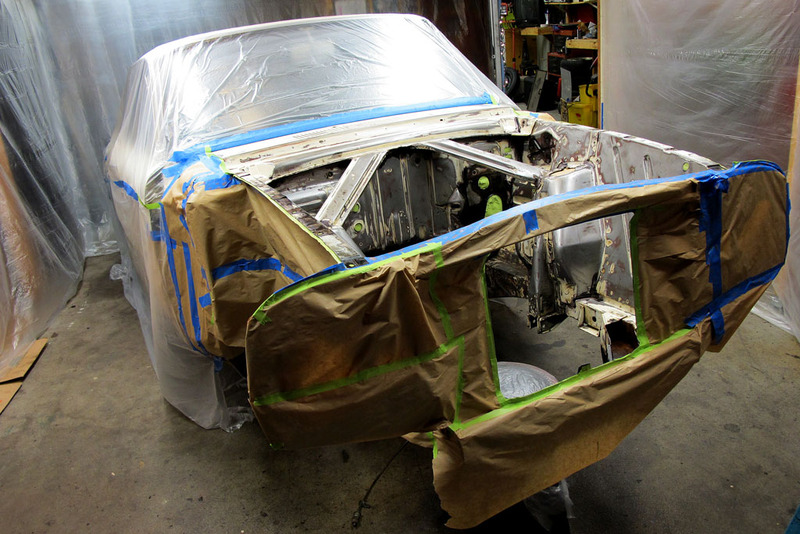 It looked awfully thin and he asked me if I’d stirred it – and I had a little bit, so I said “yes.” We pondered over how thin the paint was… but hey, I’ve never sprayed primer on a car and assumed that’s just the way it was. Not until we’d gone through 2 16 oz. batches of paint did I come to the substance of the primer jar. Noticing that the heavy paint was all mucked up at the bottom-half, kind of like a peanut butter jar, I knew that my nominal stirring at the start wasn’t nearly enough. Showing my mistake to Ethan, he shook his head at me…and I went back to stir some more! 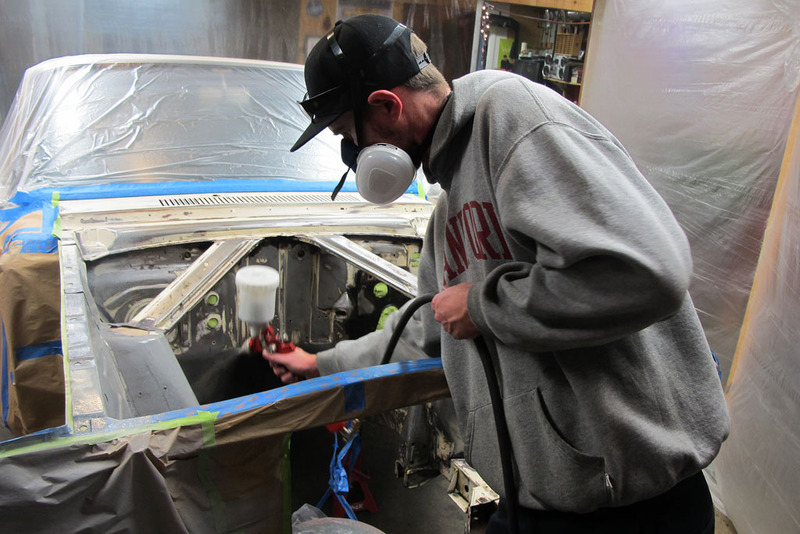 After that obstacle was crossed, we kissed and made up, and the primer layed down much nicer on Falcon’s engine bay and hood underside (the top side still needs bondo). 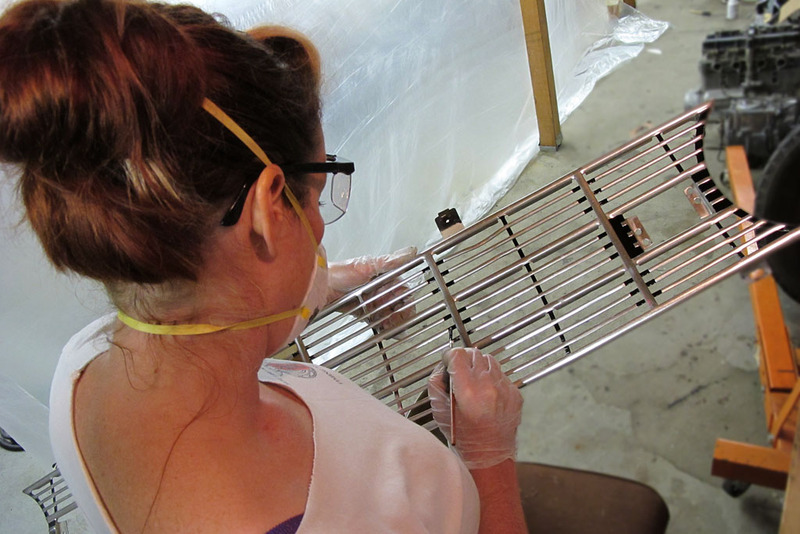 In between my mixing job, I pulled out my can of black 1-shot paint to finish what I’d started with the grill last night. The bits of black that were originally on there were mostly gone. It’s little details like this that can make a big difference! 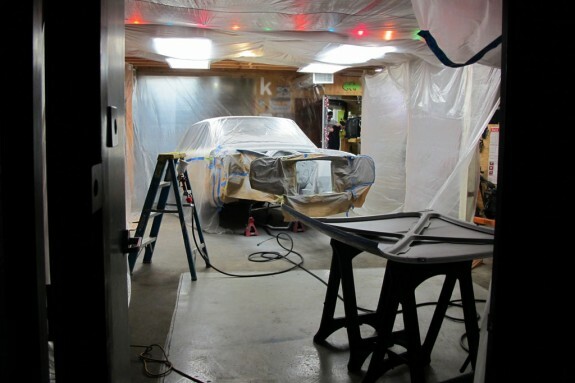 The primer has been layed (I think we’ll pick up another quart tomorrow and add 1 more coat), next we’ll have to sand it before the final color is added. The adventure continues…8 days to go!